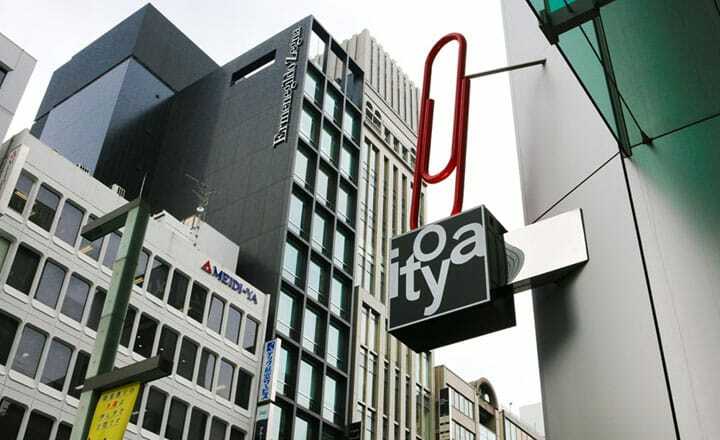 The famous Japanese stationery shop Itoya reopened in June 2015 in Tokyo's Ginza district as G. Itoya. This article introduces the features of this well-established souvenir shop and the fun activities that anyone can enjoy while visiting it. Ginza is one of Tokyo's most vibrant shopping districts. A fashionable area where many of Japan's top brands and department stores have their main stores, Ginza is also a city with a rich history and culture. Kabukiza Theater, the leading facility for kabuki theater performances, as well as many art galleries are also found in this area. Ginza Itoya, a famous Japanese stationery store, reopened in June 2015 after going through a complete renovation. Established about a hundred years ago, it is a prominent store with a rich history. Itoya deals in stationery and offers ideas to enrich the everyday lives of their customers. There is plenty to see and do in the area, so whether you are looking for some of Japan's famous cosmetics, want to enjoy some regional cuisine, try a stunning matcha parfait, or even hunt for a hidden power spot, you're sure to enjoy your time in Ginza. This article introduces G. Itoya, Itoya's new flagship store on Ginza Dori, and the six best things to enjoy during your visit there. Each floor of G. Itoya has a different concept. The SHARE space on the second floor is filled with items that help you send your thoughts to another person, such as letter paper, envelopes, and postcards. G. Itoya carries stationery from all over the world, including various items made in Japan. If you want to send a letter with a Japanese edge, try this wooden kokeshi doll postcard. It costs 972 yen. This is no ordinary Japanese-designed postcard, as it can be turned into a kokeshi doll, a wooden toy produced in Japan's Tohoku area. At G. Itoya, you can write a letter and post it right away! Buy a sheet of letter paper and write a few lines to someone special. A letter from a hotel, writing about what happened that day may be nice, but a letter from the place you're visiting right now can convey a more direct feeling, made even better with some nice stationery. You can borrow a pen at the counter, or buy one with the postal code logo. Itoya also sells originally-designed stamps, as well. A souvenir should be something compact and light. At G. Itoya, there are about 1,200 types of pens and pencils to choose from, and many tourists visit the store every day, looking for the right souvenir. Customers looking for a practical item with a fine design, can try out all the writing materials at the DESK space on the third floor. If you're looking for a one-of-a-kind gift for someone special, how about an original notebook that can be made at the MEETING space on the fourth floor? The staff will make the notebook with the paper and cover of your choice. You can also try out these ready-made notebooks. At the TRAVEL space on the fifth floor, you can find cool, functional travel items that can come in handy on business trips. This baggage tag also makes for a nice souvenir. These are 756 yen each and you can have your name engraved on it for an additional charge. The Takeo Sample Book at Itoya, on the seventh floor is a collaboration project between Takeo and Itoya. Takeo, a specialized trading firm established in 1899, carries all kinds of paper. You can check the textures of the samples and choose the best paper that fits your purpose. This is quite a unique project by Itoya. In the file folders called "fluffy", you will find a wide variety of paper with sponge-like texture. At Itoya, the customers can not only see but also feel a wide variety of paper types. You can find various kinds of wrapping paper and craft-work paper in CRAFT space on the eighth floor. This washi paper is one of their most popular items among visitors from overseas. It is the perfect paper to wrap souvenirs from Japan with. A beautifully patterned sheet of washi is a sight to behold. After shopping, go to CAFE Stylo, located on the 12th floor of G. Itoya. At CAFE Stylo, you can enjoy dishes inspired by San Francisco's food culture. The surprising thing is that Itoya cultivates some of the vegetables used at CAFE Stylo in their "factory" on the 11th floor. Itoya promotes the consumption of local products, and this is how they deliver fresh vegetables to their customers. You can also observe the growth of the vegetables here as well. G. Itoya, one of the landmarks of the Ginza area, promotes well-designed items that are easy to use. Many customers visit this building knowing that they will find something wonderful here, as Itoya has established that kind of trust throughout its one hundred year history. If you visit Ginza, be sure to visit G. Itoya. Yamada Stationery Shop In Mitaka - Find Your Favorite Item!